Sharp of both suit and vocabulary, Nighy ('The Bookshop'), is winningly deadpan as Scrabble-obsessed Merseyside tailor Alan, whose eldest son Michael stormed out of the house after a particularly heated round of the popular board game, never to return. Years later, Alan and his other son Peter (Sam Riley) continue the search while trying to repair their own strained relationship. Working from a witty and astute script by veteran screenwriter Frank Cottrell-Boyce ('The Railway Man', 'Goodbye Christopher Robin'), Liverpudlian director Carl Hunter deploys a vivid visual style and striking production design to capture the shifting moods of a family who know plenty of words but struggle to communicate. The 'Sometimes Always Never' competition has now closed. Winners will be announced shortly. Competition opens at 5pm AEDT on Sunday 3rd March 2019 and closes at 11:59pm AEDT on Sunday 10th March 2019. Five winners will be chosen at random on Monday 11th March 2019. To successfully win, entrants must fulfil the above entry conditions before the time the competition closes. Current members/followers are eligible to enter the competition. Only one entry per person. Only one winner per household. To be a valid winner, the entrant must not have won a prize from SWITCH within the last 28 days. Each winner will receive one double pass to 'Sometimes Always Never'. By entering, you agree to receive occasional emails from SWITCH in the future. If you decide to unsubscribe from these updates, any further entries will not be applicable. Only Australian residents are eligible to enter. 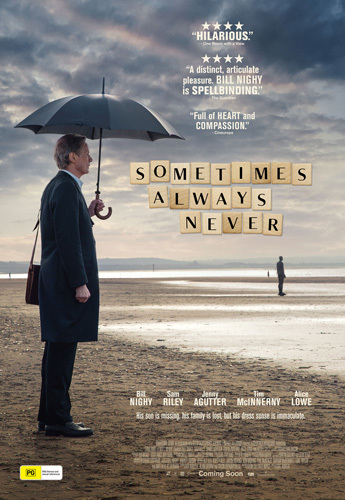 'Sometimes Always Never' is in cinemas from Thursday the 14th March 2019 through Transmission.